When engineers tackle a complex problem, their first step is to gather lots of data. Take self-driving cars: what could be more challenging than teaching a car how to navigate a busy city full of obstacles? Engineers tasked with a problem like this start by figuring out how to collect enough data to help them understand the scale and scope of the challenge at hand, as well as to feed into machine learning tools. That’s why Tesla logs millions of miles of human driver data each day to seed their self-driving platform. Getting life-saving vaccines to every child on Earth is also a massively complex problem. Vaccines have to travel across continents and through difficult conditions in low-income countries, where basic infrastructure is inconsistent or missing. Then those vaccines have to be stored in remote health clinics, some with less than 8 hours of grid power a day. And they have to be kept at safe temperatures until they’re finally administered to kids. When something goes wrong – a vaccine fridge doesn’t work right, or a clinic loses power – the vaccines stored there can be damaged or even destroyed. Those doses are then wasted, or worse, they’re unknowingly administered to kids despite the damage. And a recent WHO – UNICEF joint statement reveals that 55% of these health facilities have fridges that either perform poorly or don’t function at all. Mothers often travel many miles to make sure their babies get vaccinated. What could be worse than leaving those children unprotected? Mothers often travel many miles to make sure their babies get vaccinated. What could be worse than leaving those children unprotected? What’s so bad about freezing? Ever set your fridge too cold and wind up with ruined spinach? That’s because even a short time below freezing can damage the cell walls of delicate green veggies. Vaccines contain biological material. They must be protected from extreme heat, but freezing can be far more damaging in a shorter period of time. That’s why the WHO says up to 10 hours of moderate heat exposure is okay, but just 60 minutes of freezing exposure is considered potentially destructive to vaccine doses. Ministries of Health in low-income countries devote tremendous energy and resources to addressing these challenges. But without reliable data on how their vaccine systems are faring, too many problems remain hidden, and too few solutions emerge. When we learned about the challenges of global vaccination, we realized that identifying solutions would be easier if we first collected more and better data. We set out to design a data-gathering solution that could also serve the dedicated health care professionals working on the ground. We prototyped early, iterated fast, and tested our device in the field over and over. Our solution, ColdTrace, is a real-time monitoring and data analytics platform that turns any vaccine fridge into a “smart” fridge. If the temperature inside the fridge gets dangerously hot or cold, ColdTrace sends a text message to a nurse who works at the clinic. She can then take action to preserve vaccines, such as checking the latch on the fridge door, or turning on the generator. ColdTrace gathers real-time data on vaccine fridge temperature and power availability and uploads that data continuously via 2G network. The device can also store data for up to a year, in the event of connectivity disruption. The data gets analyzed in the cloud and displayed on a secure website. When ColdTrace started sending real-time text message alerts, nurses in clinics responded enthusiastically. Our data shows that, when vaccine fridges call for help, nurses take action to protect vaccines. Text alerts alone reduced vaccine freezing in health clinics by 74%. 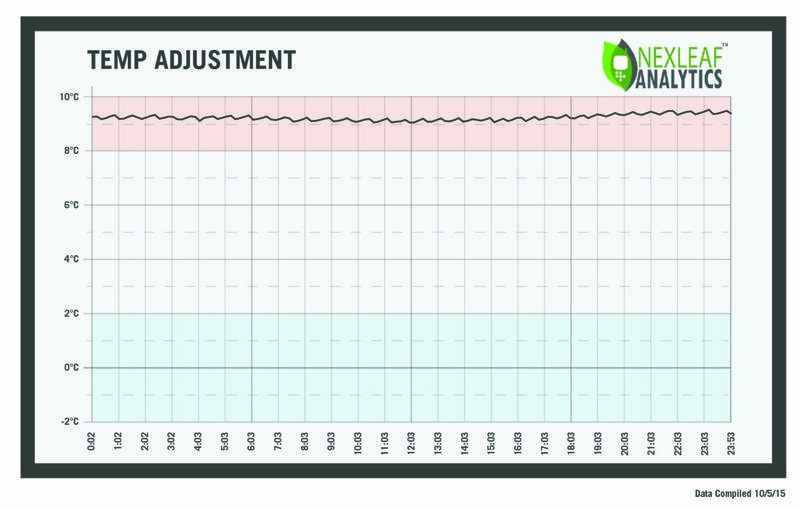 FIGURE 1: Temperature data from a fridge that needs thermostat adjustment. The temperature is consistently out of range. 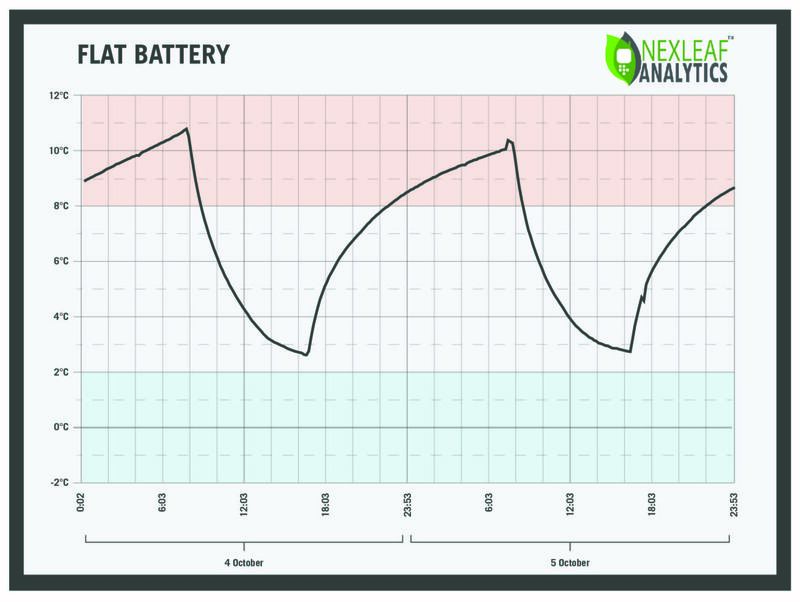 FIGURE 2: Temperature data from a fridge with a flat solar battery. At opening and closing time, when facility personnel check the temperature of the fridge, the temperature appears between 2-8 °C. However, temperature excursions occur overnight when the sun is down. What’s more: several fridges were also fixed remotely. Without real-time data from the ColdTrace dashboard, the overworked regional technician would have no visibility into these problems. Even if clinic workers detected the failure and notified the regional technician, a simple problem would require at least two visits – one for diagnosis and one for repair – which cash-strapped Ministries of Health cannot afford. Thanks to ColdTrace data and Temperature Data Signatures, many chronically failing fridges were diagnosed remotely by the regional technician in Mozambique, without a field visit. What’s more: several fridges were also fixed remotely. The technician was able to lead the nurses on site through detailed actions to fix the fridges over the phone. And after each call, the technician could monitor ColdTrace data from the clinic on the dashboard to verify that the fridge had been fixed correctly. 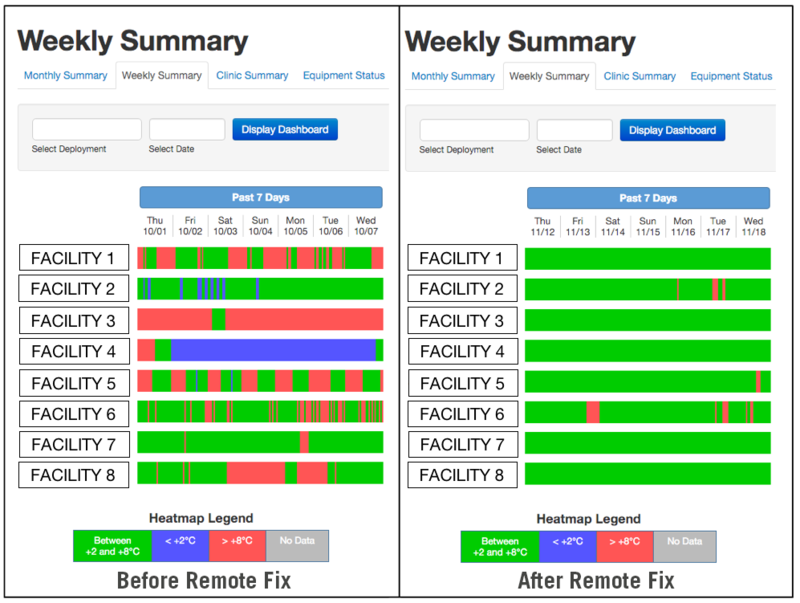 In the image below, data from the ColdTrace dashboard shows equipment performance before and after the technician fixed fridges remotely over the phone. *What is Field Holdover Time? “Holdover Time” is the amount of time a vaccine fridge is supposed to maintain safe temperatures after a power outage. Holdover Time for every fridge is established through lab testing and published by fridge manufacturers. Nexleaf’s work has led us to introduce a new metric, which we call Field Holdover Time. Field Holdover Time is the average time a fridge deployed in the field maintains safe temperatures after a power outage. Field Holdover Time can be impacted by human behavior, ambient temperature, or other factors, so it’s a useful metric for Ministries of Health because it shows how the equipment performs in real world circumstances. Our report enabled the Ministry of Health to use data to plan and budget for vaccine refrigeration management, including new equipment, maintenance, and spare parts, for the upcoming year. At Nexleaf, we believe in the power of data to change the world. to make sure that our analytics are understandable, useful, and utilized. At Nexleaf, we believe in the power of data to change the world. To see that change through, we engage in data advocacy work to make sure that our analytics are understandable, useful, and utilized. Once data reveals unseen problems, we help our partners – such as Ministries of Health – understand and apply the new information, identify solutions, course-correct, and re-evaluate using the data. This program work is vital to transform traditional interventions into data-informed responsive interventions, which include mechanisms for monitoring & evaluation, self-correction, and accountability, and result in verifiable impact. In 2016, Gavi, the Vaccine Alliance launched its INFUSE platform to identify and accelerate technology innovations designed to improve effective immunization. Through INFUSE and with funding from Google.org and Gavi, Nexleaf is working to bring the power of data to Ministries of Health, to ease the burden of vaccine system management, reveal unseen problems, answer questions, and address the most pressing challenges countries face as they strive to immunize all their children. Solutions like ColdTrace are part of what’s often called the Internet of Things for Development (or “IoT for Development” for short). While these innovations and their applications are pretty different from the convenience-oriented “smart” devices currently available in the consumer marketplace, we see plenty of similarities. The best IoT technologies serve individual users, such as the nurses in clinics who respond to text alerts. A direct application, like the text messages to the nurses, is the gateway to generating the robust data needed to drive constant improvement at every level of the intervention. And robust data in the development sector means more transparency, greater flexibility, and better outcomes for everyone. 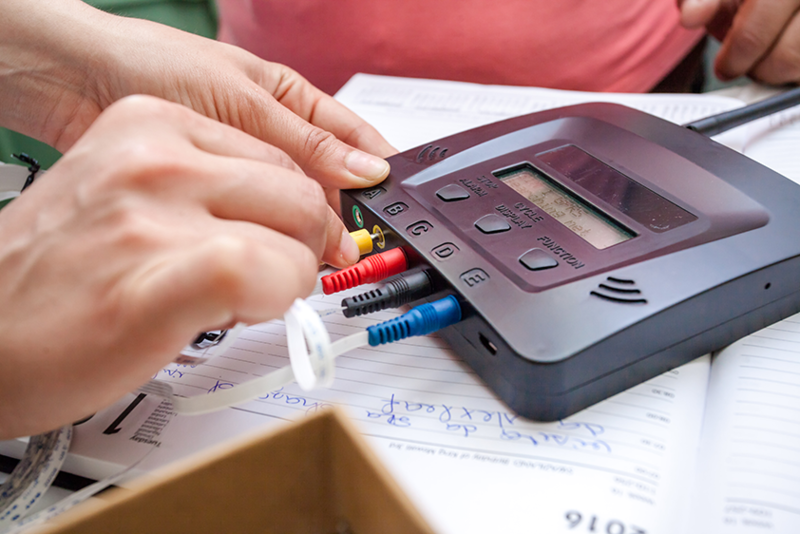 ColdTrace is currently deployed in 7 countries, and over 12,000 ColdTrace 5 devices have been installed in India as part of the eVIN program. Our StoveTrace platform addresses challenges in another global development sector: clean cooking. Click here to find out more about StoveTrace. Nexleaf’s work is made possible thanks to generous support from and collaboration with our donors and partners.